Last weekend we took a little road trip to New Jersey! Tim and I have been talking about going to New Jersey and heading to Six Flags since last summer so we were excited to cross this off our to-do list! I took Thursday and Friday off of work but Tim was only able to get Friday off. So Thursday was spent preparing for our trip, cleaning the house, and getting laundry done. Once Tim arrived home and we packed up the car we headed off! We stayed in a hotel nearby Six Flags and got up early so we could eat breakfast and head to the park. Unfortunately the breakfast at Quality Inn wasn't the best breakfast in the world. We were excited to get going anyways! One of the draws with us going to Six Flags New Jersey instead of the one closer to us in New England was the rollercoasters. We have a few good ones near us, but this park is known for its awesome coasters and we were game to try them all! We also wanted to do the safari within the park since that is something unique to Six Flags New Jersey. I had done the safari when I was young with my family when you could actually drive your own car through- now they have guided tours and special park vehicles where you are a passenger- not quite as adventurous, but still fun! As animal lovers we took a ton of pictures of all the creatures within the safari. He was only a few months old and so cute. Tim mentioned that he looked a lot like his sisters dog Attie from the back! We spent some time watching the giraffes..
Then hopped on the next jeep out and continued our tour. It was a great experience! We both said that we were glad we did the safari first since it was such a long ride. It was definitely fun but I don't know if I ever need to do it again until I am bringing kids someday! Tim had been one smart boy and bought us Flash Passes. The park wasn't particularly full on this day due to extreme heat, but we were able to completely cut the lines that there were and were able to do everything we wanted! I highly recommend spending the extra money for the Flash Pass if you want to get on all the rides. Now let's go through each ride shall we? Batman The Ride: This was a fun rollercoaster we did towards the end of our day. It wasn't my favorite coaster by far but was a good solid one. Congo Rapids: A water rapids ride that got us good and wet during the hottest part of the day. It was actually quite refreshing. We also had the added entertainment of watching some woman make a fool out of herself as she yelled at the kids in charge of the ride because her daughter didn't listen to instructions and fell. Oy vey people, get it together. El Toro: This wooden coaster was super fast! It was way more intense then it appeared and everyone was screaming their lungs out by the end. I was surprised by how fast this rollercoaster really was. Green Lantern: This was my least favorite roller coaster of the day. You are in a standing position in the ride which I thought would be very cool, but it rattled my head wayyyyy too much throughout the ride and I ended up having a headache by the end. Houdini's Great Escape: I had been on this ride at Six Flags New England and knew that it was air conditioned inside so we took some shelter from the sun. It's a strange ride but entertaining. Kingda Ka: Did you know this is the tallest coaster in the world? It was the fastest roller coaster I've ever been on, the ride being less then a minute. It went from 0 to 128 mph in 3.5 seconds and the coaster itself is 456 feet in height. It was a huge a drop down once you got to the top and we couldn't even see the coaster in front of us since it was straight up and down. Insane! We tried to go on it again later in the day but unfortunately a girl had dislocated her shoulder on the ride and it had been shut down. Nitro: This was my favorite rollercoaster of the day. I love ups and downs and this coaster just continually brought us up super high and then back down and my stomach was flipping like I love! A quick break from rides to show a picture of me reliving a family memory. My brother Dan stood like this in the same spot when he was little because he hated the noise coming from the Batmobile! Outfit Details- Tanktop is from Old Navy, Pink shorts are Lauren Conrad via Kohls, sneakers are Nike. Now, back to the rides! Superman Ultimate Flight: This was another of my favorite roller coasters. They bring you into a flying position and it made the ride so enjoyable. It was so cool to do a coaster in that way, I've never seen any other coaster like it! Skull Mountain: This was an inside roller coaster- it was jerky and kind of like space mountain but was air-conditioned and I enjoyed it! The Dark Night Coaster: This was sort of the same as Skull Mountain, but Batman themed. It was all dark inside, but wasn't my favorite indoor coaster! Zumanjaro: Drop of Doom: I kind of tricked Tim into going on this and it was terrifying. It was part of Kingda Ka's track so we kept going up and up and up. Thank god it only dropped once because I don't think my heart could've handled more! I was also trying to get Tim to relax and not let him know how afraid I was! We took this picture right before we left for the day after a fabulous day in the park! Just a last view from the car of Kingda Ka. Crazy how tall it is right? Almost straight up and down! 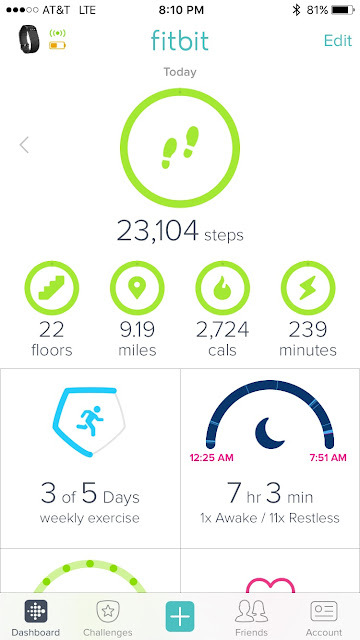 We had over 23, 000 steps on my Fitbit by the end of the day! We were completely exhausted and couldn't wait to eat dinner, shower and get in bed. A not-so-great picture of the place we ate. Tim had read reviews online about 3 Brothers Pizza so we figured we'd give it a try since it was right across the street from our hotel. It was delicious. Tim ate pizza, I had a huge plate of pasta and garlic bread and we both enjoyed our meals. Overall it was an exciting, exhausting day and we went to bed with no plans as to what we would do the next day on the way home.